AUG is not always the start codon, but whatever the codon is it will always code for Methionine (or fMet, but still a variation on Met), even if the codon codes for a different amino acid otherwise. A separate transfer RNA (tRNAi, the initiator tRNA) is used for the arrangement of this first step, guided by eIF2 [in eukarya]. In this respect it's less a question of "why AUG" than "why this specific initiator tRNA", the answer being that it's got certain sequence elements and modifications that distinguish it from the elongating tRNAs which bind elongation factors and hence are targeted to the ribosomal A and B sites instead of the ribosomal P site (with function being dependent on form, basically it's shaped to set up transcription rather than to elongate an existing nascent chain polypeptide). 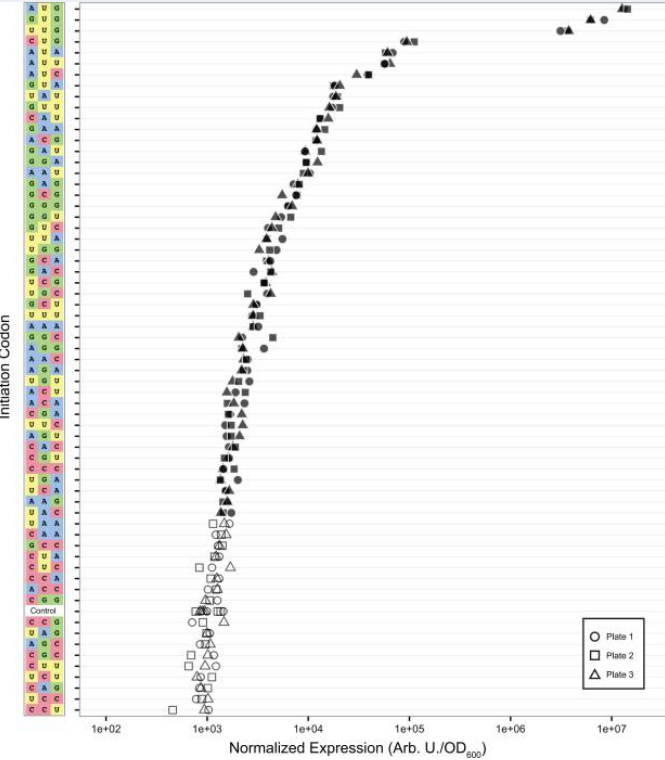 The other start codons are just from natural chemical variation (or evolution, whichever way you want to look at it) giving rise to different codon-recognising protein shapes. The machinery for starting translation works, and as such is "conserved" - evolution has kept it, and that's why it is always the same codon (more or less). Archaea have a very similar shaped tRNAi acceptor stem, and is an equally good ligand, which shows how ancient the system is and gives an idea of how fundamentally difficult it must be for an organism to change a system like this through mutation (3.5 billion years of evolution can't be wrong! etc. haha). "Naturally occurring misrecognition indicates that discriminating two base-paired near-cognate codons from the perfect three-base-paired AUG codon is subject to mistakes. Mutations in translation initiation factors, such as eIF1 and eIF2b, further increase the levels of these mistakes. Two base-pairing interactions between non-AUG codons and the anticodon of the Met-tRNAi are sufﬁcient to trigger translation initiation, suggesting that wild-type eIF1 plays a role in monitoring proper base-pairing interactions when scanning for the AUG start site. It would be predicted that the Met-tRNAi, not a cognate tRNA matching an individual non-AUG codon, is used in translation initiation at these non-AUG start codons. Basically the consensus is that it's not really possible to say why the methionine codon, "it's just a structural thing", which is a bit of a circular argument really. First of all, it is the coding sequence, the open reading frame (ORF), and not the gene that starts with an AUG. Also, there are actually quite a few ORFs that start with different initiation codons, they are just the exceptions rather than the norm. As for the need, you can think of START and STOP codons as punctuation. The AUG is read like the first (capital) letter of a sentence (if you will allow me to stretch the definition of punctuation a little). Read up on the process of translation, the ribosome will attach to the mRNA molecule which includes UTRs, it uses the AUG codon as an indication that it should now start translating. UTRs are the untranslated regions and often contain regulatory sequences that can control translation. However, these should not be in the final protein product so the cellular machinery needs a way of knowing where the UTR ends and the coding sequence begins. From recent empirical research (Wang et al., 2018) on eukaryotes, basically the non-AUG start codons have context-dependent [translation initiation] efficiency, while AUG is a "sure thing", i.e. the nucleotides surrounding it have little impact on its efficiency. We demonstrated that non-AUG codons are more dependent on their surrounding nucleotide sequence context than AUG codons. Base pairing between an AUG start codon and anticodon of the initiator tRNA along with interactions between the scanning ribosome and the nucleotides surrounding the start codon (e.g., the interaction between Arg55 of eukaryotic initiation factor 2a and the -3 position [...]) cause the preinitiation complex to shift from an open conformation to a closed conformation so that translation initiation can occur. Most preinitiation complexes undergo translation initiation when they encounter an AUG start codon whether it is an efficient or inefficient context because the strong interaction between the codon and anticodon provide enough energy to drive the conformational shift. However, mismatches between a non-AUG start codon and the anticodon reduce the binding energy from the codon and anticodon. Therefore, the contributions from interactions between the preinitiation complex and the ‘context nucleotides’ likely become more significant and necessary. We also showed that sequence context, specifically the +4 position, affects the efficiency of each non-AUG start codon differently. 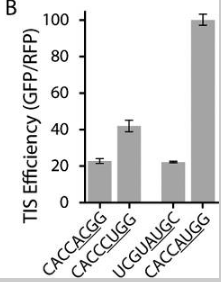 The observed differential effect of the +4 position demonstrates that sequence properties can have codon-specific effects on TIS efficiency. It is possible that there are other properties with codon-specific effects. Furthermore, differences in these properties between reporters may explain why some previous studies have identified GUG or ACG as the most efficient non-AUG start codon [...] while others are in agreement with our findings [...]. Anyway, this inversion of efficiency only happen in on some specific sequences. On average over all sequences, AUG has the best efficiency. If we go [farther back in evolutionary time] to prokaryotes, a similar study of all potential starting codons has been done on E.coli in 2017. The picture is a little bit different in the sense that while AUG is still ahead in terms of efficiency, but together with GUG and UUG does form a cluster of its own, well ahead of the rest. Of course, one could equivalently ask how comes this enzyme co-evolved with the start codons (that it decodes). But I haven't found an answer to that. I'm probably going to ask that as a separate question. Like Louis Maddox I would have said that this was almost impossible to answer. However, it turns out that there is at least one hypothesis — perhaps related to the comments on Maddox’s answer — so I feel it useful to present and discuss it. Methionine does not perform a role in proteins that other aliphatic amino acid side-chains could not, and is one of the rarest of amino acids in proteins. The synthesis of methionine (and N-formyl methionine) depends on one-carbon metabolism. Hence its adoption as an initiator of translation could have been to ensure that protein synthesis only occurred when there was sufficient energy in the cell for one-carbon metabolism, and, by implication, for protein synthesis itself. In addition, the requirement for S-adenosyl methionine for the methylation of rRNA and certain tRNAs would represent a specific coupling to other components of protein synthesis. A difficulty I personally have with this hypothesis is that I would expect a mechanism to evolve first, with regulation only appearing later. One possible way round this would be if methionine had displaced a similarly hydrophobic amino acid such as norleucine from the early genetic code, as suggested by Alvarez-Carreño et al.. Before this, one would assume that initiation did not take place at a specific codon, as discussed in relation to another SE Biology question. Not the answer you're looking for? Browse other questions tagged evolution molecular-biology molecular-genetics translation mrna or ask your own question. How are there alternative initiation codons? Why are there both stop and start codons?